The Packers are on to St. Louis for the second of a three game road trip. Should Green Bay take out the Rams, they will be one game above .500. This is not what the fans expected from the team that went 15-1 last year. Still, they won it all when going 10-6 in 20l0. Great things can still happen for Green Bay. If you are heading to the Edward Jones Dome, here are a few of the more interesting facts about the venue. It might not be as big as Lambeau Field, but the fans can certainly make enough noise to rattle opposing teams. When it comes to seating, there are none other than twelve price categories to choose from. The Rams have reserved the lower level sections that line up with mid field as their most expensive seat. That would be sections 140-141 along with 113-114. From there, the prices are lower as you fan out to the corners and end zone sections. 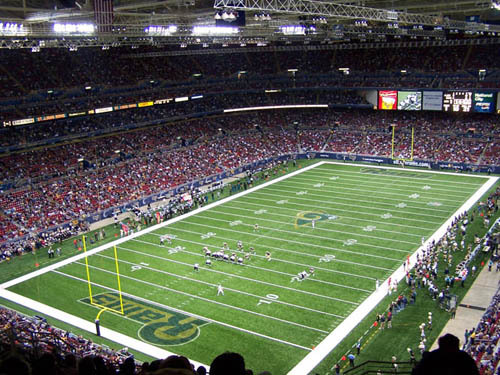 The cheapest Rams ticket would be for seats in the upper-most level end zone. There are well over 100 luxury boxes at the venue.The Edward Jones Dome opened just 16 years ago. The cost to build it topped 280 million dollars.